Deltik's top priority project Log2Log is still very active. We're working on it as hard as we can and will continue to do so until it's production-ready. Deltik's top priority project, Log2Log, is still very active. We're working on it as hard as we can and will continue to do so until it's production-ready. Don't believe that we're working hard on it? See for yourself! Creating a chat log converter is by no means easy. Me? I want Log2Log to be released as soon as possible without sacrificing the originally intended enterprise-grade quality. In order to do that, I have to learn C++ and the Qt framework on-the-fly while programming Log2Log. Log2Log was intended to be released at the end of August 2011. The development team has underestimated how much work it would take to create it, but don't let that get you down. 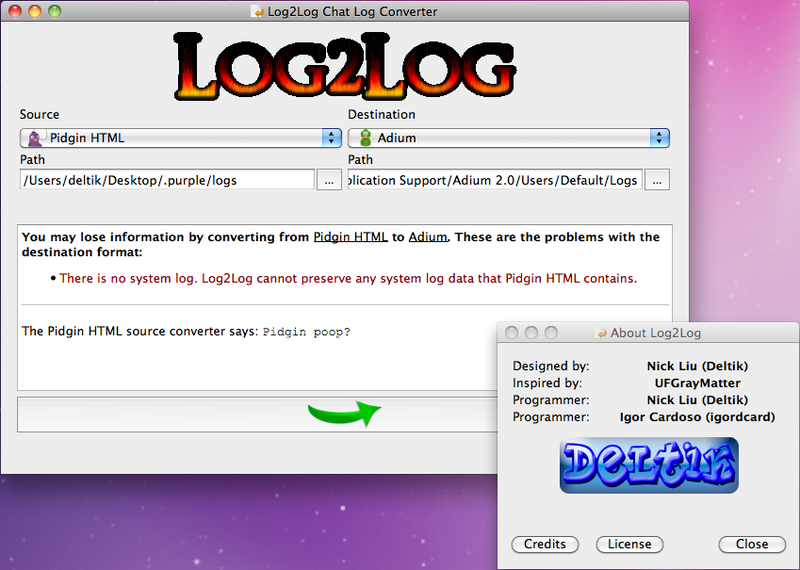 I really, really, really want Log2Log ready for people by the end of this month, September 2011. Feature to "Check for Updates"
Most of the planned format converters have not been created yet. Pidgin HTML -- Log2Log was originally created on 01 January 2011 with this format in mind. Pidgin HTML is complicated, and if I can create a good format converter for it, the others can easily fall in place. Meebo (download) -- This was the reason why I wanted to create Log2Log. The format would be very easy to convert to and from, but there is a major problem to solve: The chat logs must be downloaded from a remote server. The code for doing this already exists, but originally, I had made it in a different programming language, PHP. It's now a matter of porting it to the language that Log2Log is now programmed in, C++. Log2Log JSON (standardized export) -- For advanced purposes, I intend to create this format converter. Theoretically, this should take only minutes to create because it directly exports what Log2Log already does in the background. Trillian -- Trillian stores its chat logs in XML format. Pidgin HTML is also like XML, so with that established foundation, I should have no problem creating a format converter to and from Trillian. Windows Live Messenger -- By input from an eagerly waiting person, I'll create the Windows Live Messenger format converter. I looked at the chat log format, which was XML as well. Since Pidgin HTML will have been completed by the time I start working on this format converter, it should be very easy to read this format. AIM -- Also by request, I intend AIM to be the sixth format converter I make. AIM chat logs are in HTML, and they resemble Meebo chat logs, but they're somewhat more detailed. It seems rather easy to create this format converter as well. Skype -- Personally, I also want a Skype format converter. There is a major frustration, though. Skype thought that it would be funny to create their own eccentric chat log format. The format makes absolutely no logical sense at all, but all the data exists. In order to read it, I have to drop down to a very primitive level and scan the binary data. I started work on it in PHP, but once again, I have to port it to C++ because Log2Log is now written in C++. Loguntu has been envisioned, and some planning has been done. As for a server to host Loguntu on, we are trying to secure one by 04 October 2011.